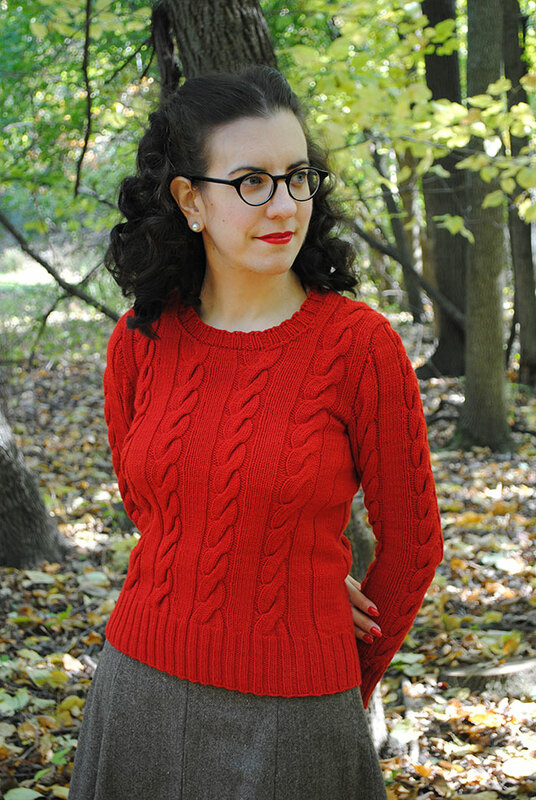 I started my fitting and knitting a 1940s pullover series earlier this month, and I told you it would go fast! You saw a few peeks here and there of the project as I knit it… in fact my blog and Instagram have been practically a sea of red yarn lately. 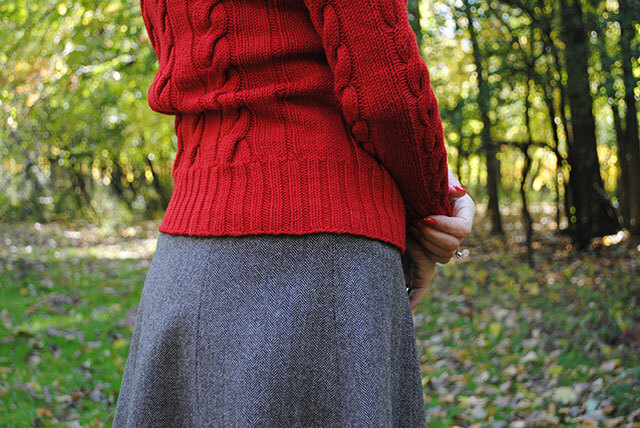 But today you get to see the finished pullover! And boy, I really couldn’t be happier with the final sweater, let me tell you! 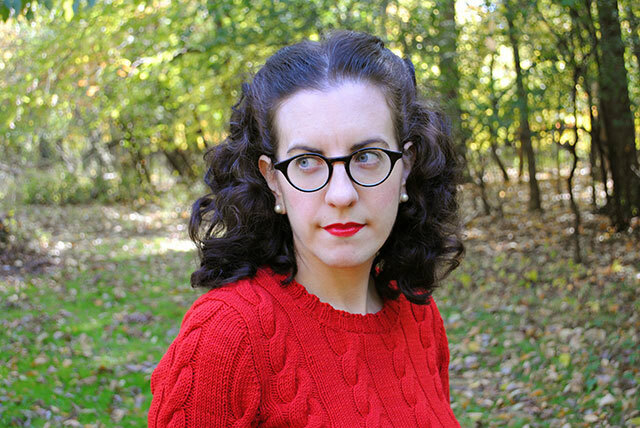 This ticks so many boxes in my never-ending list of things I need in my closet: A solid red pullover. 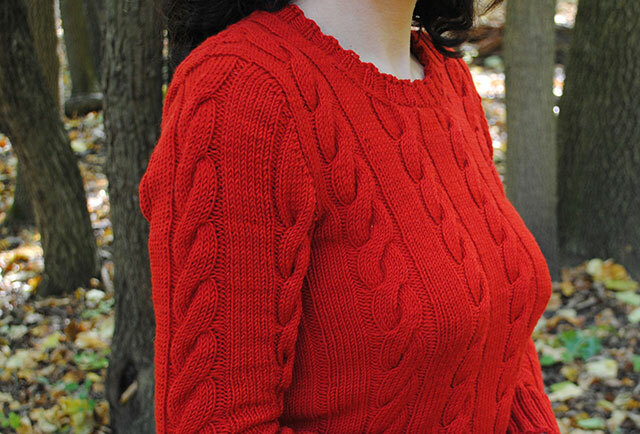 A cabled pullover. A pullover warm enough to wear in the dead of winter here. A pullover that’s long enough in the torso I can wear it with just about anything. Check, check, check, check. Thank you! If you haven’t been following along, I’ll give you some recaps on the details. 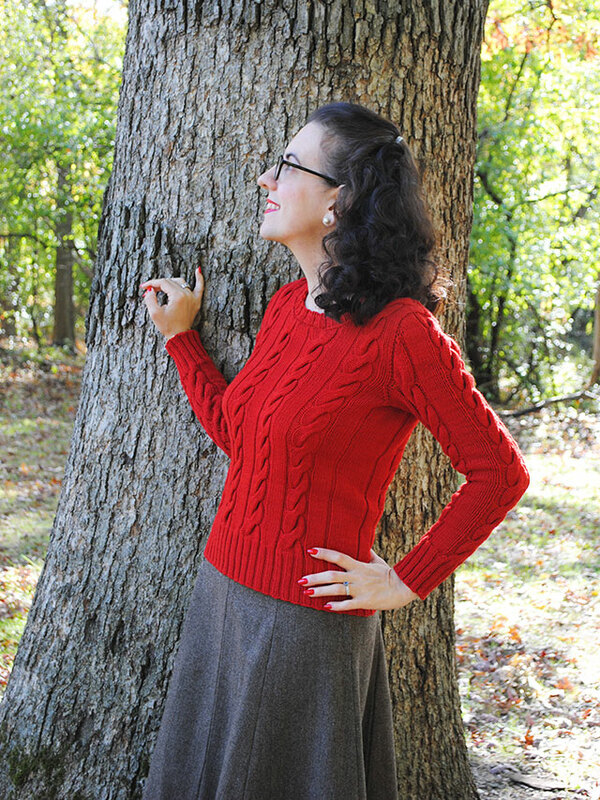 This pattern was knit from a 1947 pattern meant for sport-weight yarn (Ravelry pattern link). However, I modified the gauge to knit this in DK weight, one yarn weight heavier, knitting it at a gauge of 6 stitch per inch. The yarn is Wollmeise Merino DK, which has great stitch definition. Modifications I made to the shape: the torso is longer, I omitted one knit stitch in each of the stockinette panels in the body to account for my different gauge (I actually forgot to do this on the sleeves, ha ha! ), and I lowered the neckline. And of course, just so I could write up the tutorial because I love you all, I knit the sleeves seamlessly from the top down! Here’s a look at what the sleeve decreases look like on the inside of my arm. You may notice they stop around my elbow. That’s because I didn’t want to decrease away so much that I’d lose those two cables closest to my inner arm. The pattern is stretchy enough that it fits just fine. I knit this pullover with zero ease. That is to say, the finished size is the same as my full bust measurement. That’s from the hem on up to the armhole bind off rows. That gives it just a bit of an easy, relaxed fit in the body that I love for this pullover. I really can’t say enough good things about this pullover. 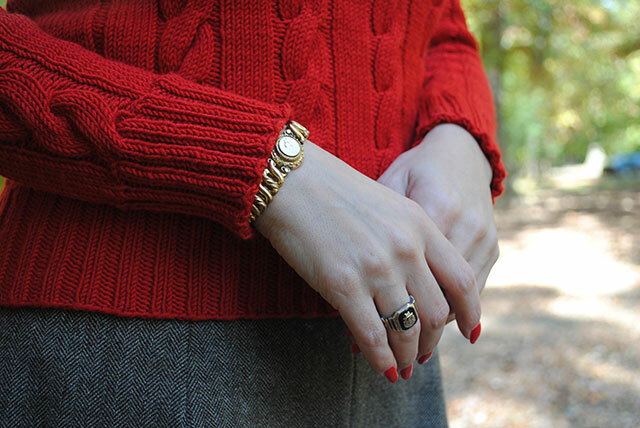 It’s an instant staple piece and would work well in a vintage or modern wardrobe. 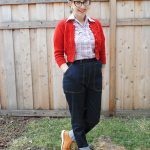 If you’ve ever shied away from some 40s patterns due to the short torso length (like the length on my Dragonflies Jumper), simply add a few more inches. It can make all the difference in style and fit. I’d say I did the cover proud. What do you think?? 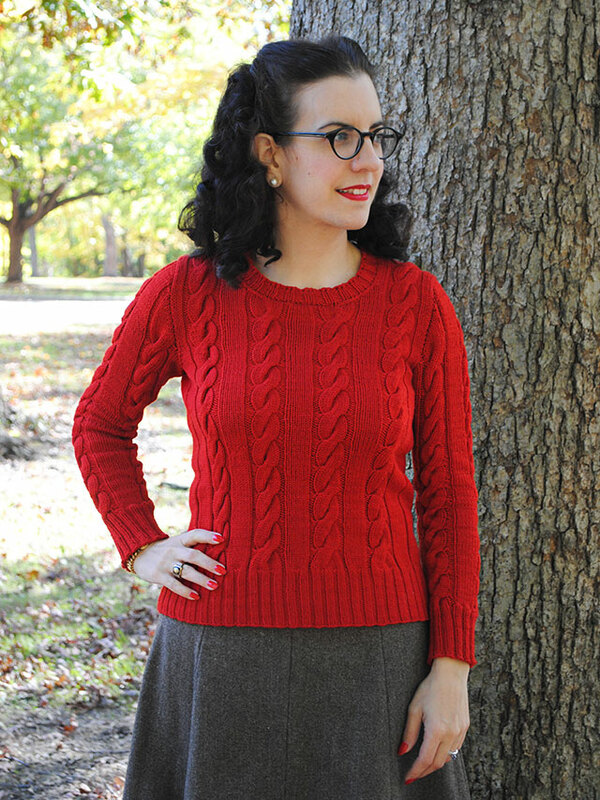 If you missed the 40s pullover series and want to catch up on how I altered this vintage knitting pattern, you can see all the tagged posts here. I’ll also post a link round-up on Friday. 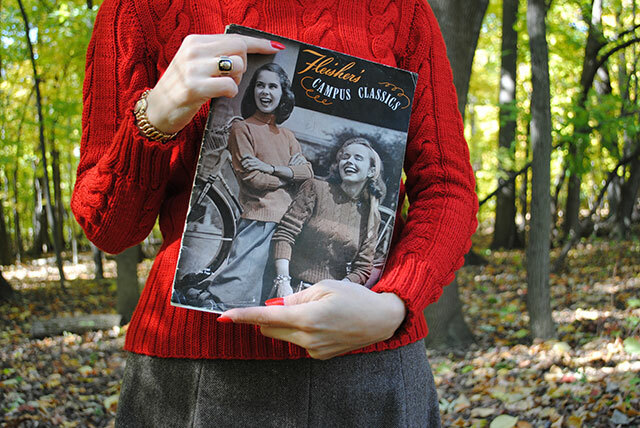 Hungry for more on the 1940s-inspired knitting front? Then you better stay tuned!! beautiful sweater.. love the way you knitted sleeves, and that color is gorgeous.. Absolutely delightful! Gorgeous sweater and color! Though I have been following your tutorial and added this pattern to my ravelry queue, I think it needs to be moved to the top of the queue!!! I love everything! Your snazzy new jumper is terrific! You look fantastic! Seriously gorgeous, you’ll get loads of wear out of this. I’m in awe of your knitting skill with all the alterations you make too. Wow, this is absolutely gorgeous! I love it! I knew the finished sweater would be nothing short of beautiful! Million thanks again for the awesome tutorial and snaps of this amazing project! You rock!! As i said before, you’re my knitting idol!! I would love to learn it, but don’t know where to start…any suggestions? Wow! 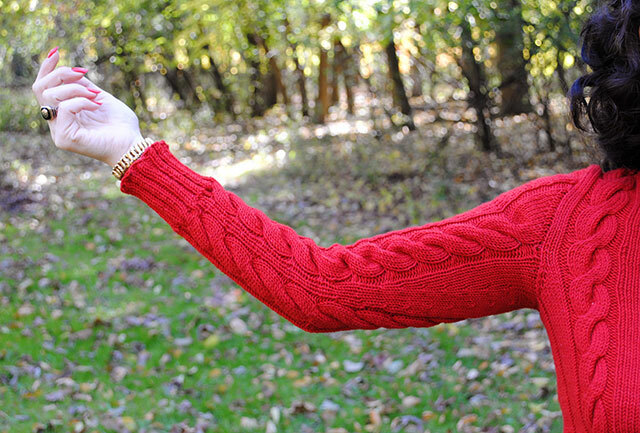 This is amazing – and even more amazing is how quickly you knit! How long do you spend on it each day? I’m very much a newbie knitter (for clothing anyway) so many of the techniques are still a bit beyond me, but this has been super interesting to see everything explained so clearly and thoroughly. Your explanation of resizing I will definitely use – I love vintage patterns, but am a lot larger than vintage sizes! Brilliant! This is unbelievable! It’s truly the perfect sweater. 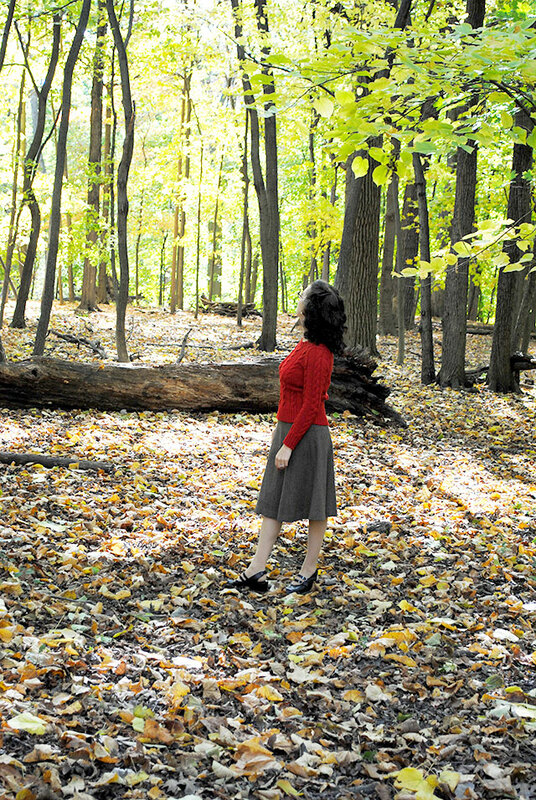 Red, long sleeve, and warm, it will be great for winter and your wardrobe. Beautiful sweater and lovely pictures! I admire how you are able to finish projects soon enough to wear them for the season and your willingness to share your “know how”. So pretty and classic, Tasha! Red is really your color! You are so talented! I just adore sweaters and have always wanted to learn how to knit. I’m starting to learn how to crochet but am not the best at it, but I guess practice makes perfect! Once again, you’re amazing and I love this sweater, and outfit! Your new jumper is adorable and your knitting skills are amazing…I must admit most of the series left me completely bamboozled (being a non-knitter, sadly), but I can admire the finished article. Beautiful! It’s gorgeous! I love it with the tweed skirt you made. Tasha, this is absolutely stunning. OK I admit it, red is my favourite colour, so any jumper would look good to me, BUT this looks REALLY good 😉 (I also love the skirt). Pretty, pretty, oh it’s perfect! Really, really pretty sweeter. It’s so classic, stylish and cozy looking. I love, too, that it’s vibrant red hue makes it a natural shoe in for some cold weather holidays like Christmas and Valentines, if one so wanted. 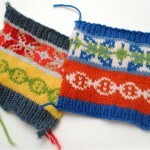 Stellar work, dear Tasha – your knitwear projects always knock my socks off! Thanks Jessica! Ooh, that is entirely true about the holidays! Having knit myself a Christmas pullover I’m entirely on board with holiday-themed clothing like that. Thanks for planting the seed in my head! Very nice – the fit is spot-on, and the colour looks great on you too. WOW! The jumper looks fantastic. Red is DEFINITELY your color! And, your herringbone skirt is perfection. I actually have a sweater that is so similar. It has a v-neck and it is a orange, but the cables and other stitch patterns are almost identical. I think this turned out beautifully! And you DID do those forties’ cover girls proud. Side note: how neat is it that you have your grandfather’s HS class ring? An antique AND a personal connection, I love it. Fabulous jumper! It looks absolutely great. It has been really interesting reading about how you have altered the pattern. Excited about the next lot of knitting news. 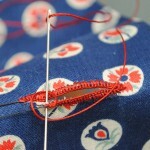 Your jumper looks amazing and I have followed your blog posts on how to adjust the pattern to suit. Thank you so much for sharing and all the trouble you have taken with your posts. It looks stunning. I love it and it looks wonderful on you. Wow, I’m super impressed by your knitting skills! the colour is amazing! The sweater is lovely and I really love your hair like that. 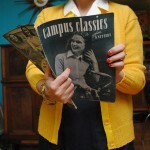 Very collegiate – I love it!